New to Vostok - which one to get? Thread: New to Vostok - which one to get? Re: New to Vostok - which one to get? Dub Rubb, FBPB and Kotsov like this. Ok the scuba dude is obvious. 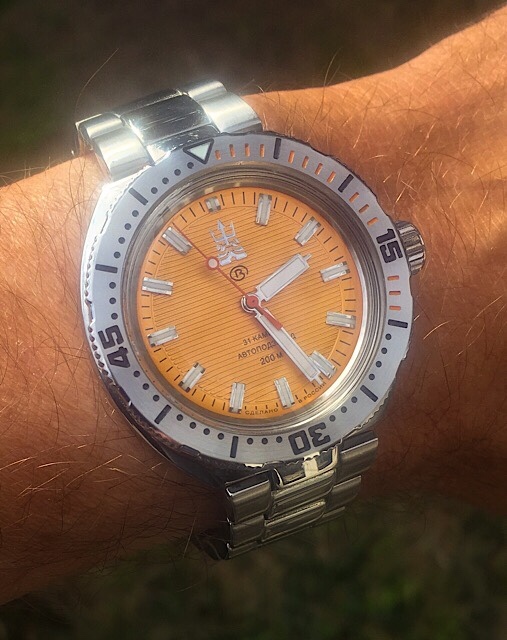 If you're crazy enough to buy Vostok - then there must be something wrong with your brain if you don't go for the scuba dude dial. Yes - but I want something classy and refined. That's who I am. And Vostok offers this with their 2019 catalog. Just wondering if its accuracy is as pretty as its looks. PanKorop, stevarad, antilucem and 2 others like this. Which Scuba Dude are you guys suggesting .... full wetsuit Scuba Dude or Speedo Scuba Dude ? Can you explain what's going on here? I realize it's obvious to many of you, but it's not to me, and I'd guess to others as well. 1) The Neptunes (960xxx) have a case which is meant for a proprietary bracelet. On the “classic” line, the quality of this bracelet is... questionable at best, with its folded links, so many want to change it for a strap. 2) The 960 lugs need special adapters, screws, and/or cutting standard straps to fit. So one decided instead wth drop the case and its issues, go for a non-Neptune, with standard lugs. I would just go for a Neptune SE, which has a decent bracelet, or buy such a bracelet. Some watches are meant and made for a bracelet (think of many Rolex), and if you don’t like it, just get another watch. See, this Neptune SE below to me was near-perfect. Yet spoilt by a cheap bezel with poor colour match, so I had to change it, while keeping dial, case & bracelet. stevarad, ohhenry1, spencj12 and 5 others like this. Sorry..... I purchased a 710 ministry case from Meranom and put the Neptune movement, dial, crown, etc. into it. It's a simple 15 minute swap, and I like the look. ohhenry1, Dub Rubb and PanKorop like this. Are you serious? Vostok has a resale value? I am reading on the internet Russians will prefer Swiss or Japanese. They don't understand why Westerners buy Vostok. Probably for the same reason the Japanese love KFC. I don't have the dude on the dial of my watches but I hold him in such esteem that he is on all of my case-backs. If this is your first time purchasing the watch, kindly manage your expectation. It's famous for poor quality control and bit of slight wrong here and there (don't expect to be too perfect). Furthermore, the thickness is also quite challenging (about 15 mm). Other than that the styling is indeed unique and it also has both strong heritage and cults. Which one to get? New Armida A2 or Obris Morgan Explorer? Seiko SNM03x or SKZ25x? Which one to get? Time for another Seiko... Which one to get? !